There's nothing like a large, high powered surround sound audio system for the ultimate in home theater enjoyment. If you're into such things. Many people, however, don't have the room, the budget or simply don't care enough to go through the hassle of installing a surround system, stringing wires around the room, setting up multiple speakers and multiple pieces of equipment. For them, there's the Z-BASE 550, from ZVOX. It's a "one stop" way to get decent audio quality, and it takes up hardly any space at all. In fact, the ZBASE 500 doubles as a little stand for your flat panel TV, so it not only requires very little room in your room, it practically disappears as well. 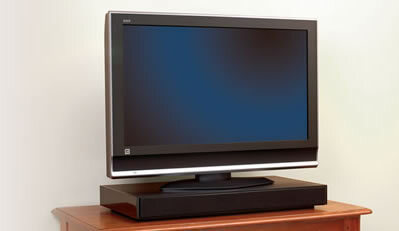 The $500 Z-BASE 550 is a slim little black box that fits under "most" flat panel TV's. The company says it can hold TVs of up to 47 inches (measured diagonally), though we tried it with a 58 inch Panasonic plasma I was reviewing at the time and it worked fine (it may be a bit slimmer now, though, due to the Panny panel's extra weight!). I do believe something more in the range of what ZVOX recommends would be better, though. The Z-BASE 550 offers two sets of stereo analog inputs for your TV and another component (you could hook in a Blu-ray or DVD player's analog outlets, for example) and also includes an output into which you can connect a subwoofer. The Z-Base has a 60 watt amplifier built into it and the speakers include five, two inch full-range drivers and a 5.25 inch subwoofer. All the speakers are built in, though you can hook in a separate subwoofer if you like. That's what I did after testing it on its own first and, while it works as advertised without the external sub, I preferred the extra oomph the sub provided. The 550 uses "specially treated long-excursion main drivers" and the speakers' magnets are magnetically shielded Neodymium models. The cabinet is made of MDF (medium density fiberboard), the same kind of stuff used in many higher end loudspeaker enclosures. The unit features ZVOX’s "PhaseCue" technology, which they say creates an experience that approaches surround sound. I didn't really notice a lot of sound coming from behind me, but the spaciousness from side to side was quite remarkable, making it seem as if there were invisible speakers mounted out in the room, far off to the sides of the flat panel. PhaseCue messes with the audio channels' phases make your ears think the sound is coming from a variety of sources throughout the room. Sounds like black magic to me, but it works. It does create an impressive soundstage, but it isn't really surround. Quite a satisfying experience, though. It won't replace my Rotel powered, JBL driven 5.1 system, but it also sells for less than any one of those components. Set up is child's play. All you have to do is place the unit on whatever stand you're using (table, shelf, cabinet, etc.) and park your flat-panel TV's built-in stand on top of it. Then run the stereo audio output from your TV and/or playback device, plug in AC power cord and fire it up. I only used one set of inputs, coming from the TV and to the ZVOX. The audio output from my Blu-ray player went to the TV first, via HDMI, and then back out to the Z-BASE. This arrangement worked fine. Digital inputs would be nice, and ZVOX does make a commercial version of the product that features them, but the company says it opted for the simplest operation possible, so technically-challenged people can get up and running with the minimum of hassle (though how hooking up two analog cables is easier than one digital link is a logical leap I'm unprepared to make). Here's how ZVOX describes it: "ZVOX has always championed an analog-based virtual surround technology because it sounds more natural, more musical than digital counterparts. Rather than increase costs with digital inputs and chipsets, ZVOX dedicates resources to real wood enclosures, exceptional loudspeakers, and first-rate customer service." This ease of use includes an "auto sensing" feature that turns the unit on automatically when it senses a signal coming in; this makes operating it via the TV's remote simpler. The unit does sound very good and fills the listening room very well. As mentioned, it doesn't replace a true 5.1 surround sound system (nor does the company claim that it will), but it's pretty darn good. The only real flaw it had was that, despite the "PhaseCue" technology, I would often find the center channel weak, and that dialogue was often soft or muffled. This can be ameliorated somewhat by adjusting the PhaseCue setting on the remote, but not completely. I did think it gave the most satisfying results when I ran it in stereo, which isn't always possible if you're running a DVD or Blu-ray or even an HDTV broadcast, many of which only offer variations on the 5.1 theme. For this reason, you might find yourself tweaking the PhaseCue buttons quite a bit. This gives you a good reason not to lose track of the ZVOX remote even if you use the TV's remote to adjust the volume (which is quite feasible if your TV has "variable" audio output). I did miss having a front panel display that reads out the current settings. As it is, you have to keep track of the pulses from the blue LED on the front panel and, if you're anything like me, you may find it difficult to remember what your current settings are and therefore have to scroll up and down, counting the blinks until you figure it out. This was my only major complaint, and it did effect my enjoyment of the unit, though it wasn't enough for me to toss it in the bin. On the plus side, the Z-BASE 550 plays nice and loud. I noticed some distortion as the decibels rose to nearly excessive levels (Hey, I had to try! ), but overall I was very impressed with the quality of the unit's audio output. I played a variety of sources, including Blu-rays, DVD's and audio CD's, and came away with a healthy respect. I wouldn't want it to be my sole audio system, but for people who don't live and breathe this stuff it can be a very good choice. The sound quality is far better than I had expected. The ZVOX Z-BASE 550 is an interesting choice for people who don't want to run wires, set up speakers (let alone surround speakers!) and generally have to install a dedicated audio system. One caveat is that the unit isn't as suitable if you hang your flat panel on the wall, for obvious reasons, but even then you could still sit the Z-BASE on a shelf below it and crank it up. In all, an impressive audio platform, much better than I had anticipated going in.